We started working with Sibbalds in 2008 to develop their branding and provide an overhaul of their website which was very much out of date and not ranking on Google. We have gone on to work with them on their print and digital marketing. Sibbalds, a firm of Chartered Accountants in Derby, were going through a period of change and reviewing their long term strategic goals. They had a clear vision as to the direction they wanted to head as an accountancy firm and a rebrand was one of their main priorities. They felt that their previous logo was old fashioned and didn’t reflect their brand values and ethos. We submitted a number of ideas and after a lot of discussion we all agreed on the choice of purple as being their primary colour going forward. We also used the ‘S’ to form an abstract logomark which is used as a motif and watermark in many of their print and online materials. As you can see from some of the designs below, we went through a number of iterations and design combinations in order to reach the final logo design which uses a distinct form of lettering. This was their original logo and branding colours which was getting outdated and needed a refresh. This was the logo we finally settled on. The distinctive logomark incorporates the ‘S’ and is used extensively in their marketing. 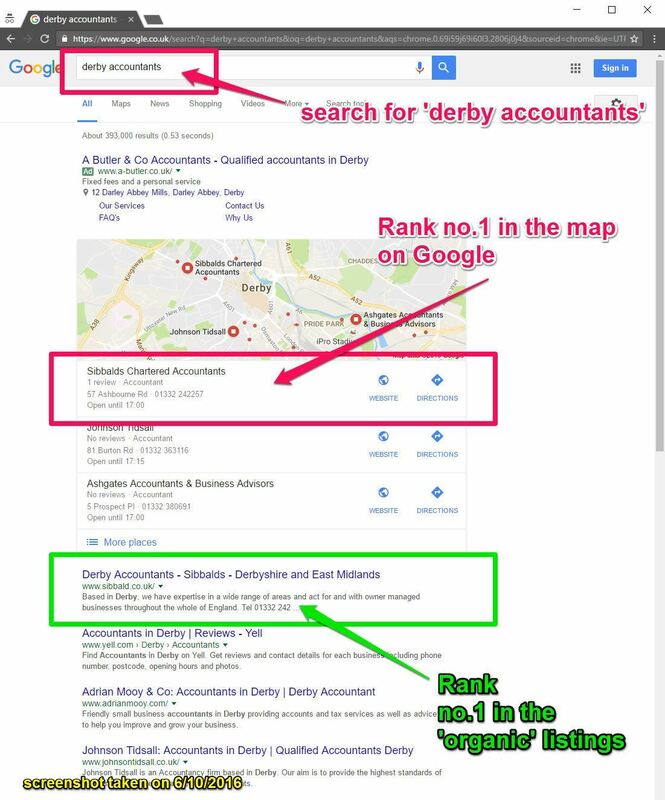 We started off by researching other Accountants’ websites and found that many of them were very similar to each other and based very much around the services being offered. A competitor website would typically have a home page linking to each of the services that firm offered, information on the firm and its people and a contact page. Adopting this approach doesn’t always help website visitors who will not necessarily know which services they need. Sibbalds’ clients range in size from small traders to multi million pound turnover companies. Their services are not a ‘one size fits all’ so the website needed to cater to the various types of clients or ‘personas’ that they serve. The home page has a prominent section – ‘What best describes you‘ with the choices ‘Start up company‘, ‘Established business‘ and ‘Individuals & Trusts‘. When Sibbalds created their strategic plan, they also developed a set of core values – what they have called ‘The Eight Promises‘. These promises are reinforced throughout the site together with testimonials, links to team members, related services and case studies. For the Sibbalds website, we sent Suzanne Mcfadzean off to get some photographs at 3 of Sibbalds’ clients for use on their website. We chose clients of different sizes and from different industries. They include The Flowerpot pub in Derby, Henman Dunn, a plumbing and heating business and First Fence, and a large company which supplies railings, metal fencing and hoarding to a wide variety of businesses. I have seen your Case Study about us and it looks great, the photographer did an excellent job capturing the business. How do we get our website to on Google? This is probably the most common questions we get asked by our clients. The answer is that it is not possible to guarantee a top ranking (despite the claims made by some marketing companies) as the ranking order is determined by the rules Google sets out – what’s referred to as it’s algorithm. Having said this, we will always work hard to identify the keywords you need to rank for and then use the appropriate ‘white hat’ methods and tactics to get the site ranked for these keywords. Our results speak for themselves. An important part of the website redesign is the initial SEO audit which, among other things, identifies the keywords the company or business wants to rank for in the organic (i.e. free) listings. 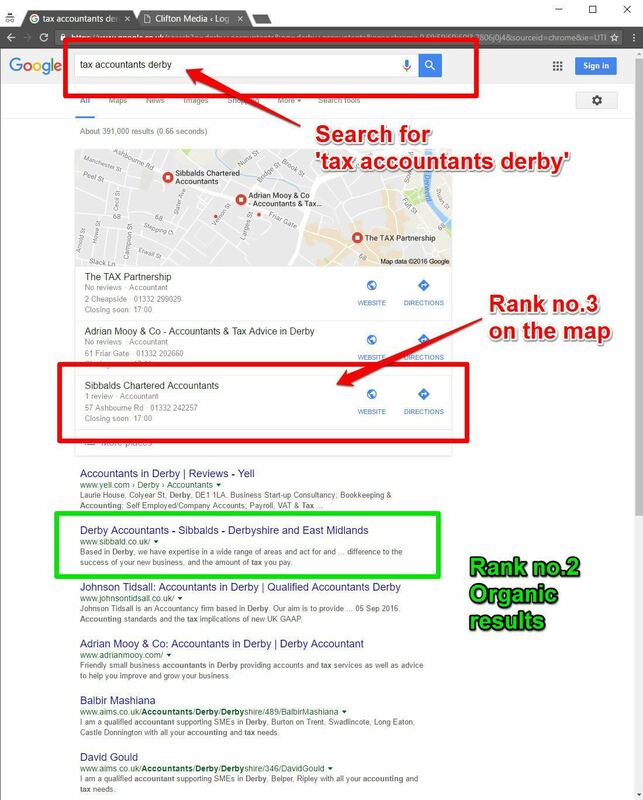 In Sibbalds’ case, the phrase ‘Derby Accountants‘ was the most competitive and sought after phrase and we are still delighted that Sibbalds rank top both in the map AND the organic listings. For proof, you can see the screenshot taken on 6 October 2016 below or click here to view the current results. Sibbalds also produce a monthly email newsletter and bi-monthly ‘Pay Less Tax’ email newsletter. We designed the template for the newsletter and created the graphics and articles used on each newsletter. We manage the main social media Accounts for Sibbalds. These include the Facebook, Twitter, Linkedin and Google+ profiles. Content relating to news at the firm. An example is an employee doing a local event like a charity run etc.